You wouldn't know this from listening to Apple, but as well as the HomePod having superior sound, it has a feature that Amazon's Echo does not. You can place and receive phone calls through your HomePod. It means this smart speaker gives you ambient computing -- the Star Trek-like ability to communicate with anyone just by saying aloud that you want to. It's a real phone call, too, not a more limited implementation like on the Echo. If you have an Amazon Echo, you can use it to call people but only if they also have an Echo. The call will go to their device or, if they have the iOS app, only then to the phone. Whereas HomePod is a true speaker phone. It's no more a phone than an Echo is but because it's paired to your iPhone, it's able to act as one. This feature was not present when the HomePod was launched, but whenever you set yours up, you will have been asked to allow what Apple calls Personal Requests. The on-screen message explains that this allows anyone to "use this HomePod to send and read messages, add reminders, create notes, and more with this iPhone." That "and more" part is where phone calls come in. If you've granted permission for Personal Requests then you've already set up most of what you need. If you didn't grant permission for Personal Requests, you can change your mind now. Open the Home app on your iPhone. Press and hold on the icon for your HomePod, if you've just got the one, and then tap Settings. Scroll down to Personal Requests and switch it on. If you've got more than one HomePod, you have to do this with each one individually. Now as long as your iPhone and HomePod are on the same WiFi network, you can make and receive calls without taking your phone out of your pocket or bag. Say "Hey, Siri, call my Mom" and Siri on your HomePod will ask you to confirm that you want to call her. If she's got several numbers, Siri will ask which one. Say "Home" or "Mobile", for instance, and now HomePod is ringing that number. Or you can say "Hey, Siri, dial 0121..." and then any phone number. When she answers, you'll hear her over the HomePod speaker and you can just talk like you were on a regular speakerphone. In our experience, HomePod is better at letting you wander across the room than a normal speakerphone is, but there are still limits. We've made many calls where the recipient had no idea we were on a speaker and yet others where they simply couldn't make out a word we said. It comes down to the line quality and the signal, though, rather than anything on the HomePod itself. Most often, the only time someone would know we were calling via a HomePod was at the end of the call. You can say "Hey, Siri, hang up," and it will. If you do that, though, your recipient will hear it before Siri can slam the phone down. In practice, often enough it's the recipient who hangs up at the end of calls, in which case HomePod just stops being a phone. Other times, since your iPhone has to be on the same network, it tends to be nearby. And then, if only through habit, you tend to tap the End Call button on the phone. If you're the sort who must answer a ringing phone instantly, this is not for you. It takes a few moments to get HomePod to answer, although there are two completely different ways to do it and one is substantially faster than the other. Answer a call on your iPhone, tap Audio and then you can choose to route the call to your HomePod. 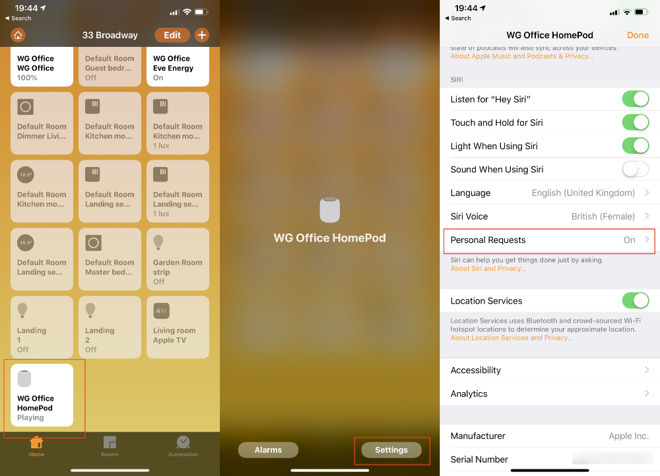 In this example, the HomePod is named "WG Office"
You can pick up your iPhone and initially answer the call as normal. You have to swipe to answer it, but then the moment you've done that and the call has begun, you get the familiar six icons such as Mute, Keypad and so on. At top right, there'll be one marked Audio. Tap that and you get a pop-up menu with a list of all the possible ways you can listen to a call such as the iPhone's own speaker. However, there will also be a HomePod option -- and it will be called whatever your HomePod is named. If you have more than one, they'll each be listed separately. Assuming you know which one is nearest to you, you can just tap on that name and the call will transfer to that HomePod. It's only one swipe, one tap on a button and then one tap to select from a list, but it feels longer because your call is connected and your caller is expecting you to speak. Plus, it takes a moment for the HomePod to take over the call, so this really isn't for people in a hurry. What might be better for them, is the other way of answering calls. You can instead skip all of these steps and just tell your HomePod to answer the call. Say "Hey, Siri, answer my phone," and it will. There's still a moment's delay as it takes over, but at least your caller isn't listening to you fumble for the right menu option. If they hang up before you can get to it, you can say "Hey, Siri, who just called?" Siri will tell you the name, if they're in your contacts list, and offer to call them back. Answering one phone call by telling Siri to pick up the phone is tremendous. Placing one call by just asking Siri to dial for you is frankly addictive. Where it stops being all that good is when you have two phone calls simultaneously. When that second call comes in, you can of course deal with it on your iPhone as you ever would. But you can also handle it on the HomePod. Tap the green light on top of the HomePod and you will put the current call on hold while answering the new one. To ditch the first call and just take the second, you can double-tap that green light. And to switch between the two when you've answered them both, you can tap on the top of the HomePod. It's a toggle -- tap to move to the other call, tap again to move back. It's not as if that's hard to remember and you'll certainly get it after you've used it a few times, yet somehow it's not the part of HomePod that we'd shout about. Having to tap on a speaker is practical but it's not what Apple would call magical, whereas making and receiving calls just with your voice definitely is. It's peculiar that Apple doesn't trumpet this feature, both because it's great and because Amazon Echo can't do it. Google Home can make calls, too, and Google doesn't shout about it much either. That might be because setting it up is more fiddly than with Siri and HomePod, but otherwise it works just as well. How many are uncomfortable with the idea of an open microphone in your home at all times connected to the internet? I do not care who makes it, I turn that stuff off. It is one of the reasons I prefer a headless Mac- no camera or microphone to worry about. I can plug or unplug a USB mic or camera whenever I need it. Yes – good article, William. Do you own an iPhone or iPad? I don’t have a HomePod but have seriously considered one (I’m loaded up with Sonos and love them but choice is a good thing). One question I’ve got related to phone calls is Skype and other VOIP apps. We use Skype and Jabber at work and I’d love to use HomePod for those - how well do they work? Unfortunately my work machine is Windows based but Skype I can (and do) route through my iPhone. Personally I also use FaceTime audio all the time as most of my family and personal contacts have iPhones. While this article doesn’t mention FT-A or FT-V calls I assume that’s the same as regular voice calls, correct? I have used this feature. Odd as it seems, the habit of using a handset to make or receive phone calls is hard to break. Also, I wish Siri had a customizable hangup command so I could say something of my own choosing like "Goodbye Goodbye" and it Siri would treat that the same as "Hey Siri Hang up." MacOS apps work horribly. The Hompod uses Airplay to and from the PC and the delay makes it unusable. 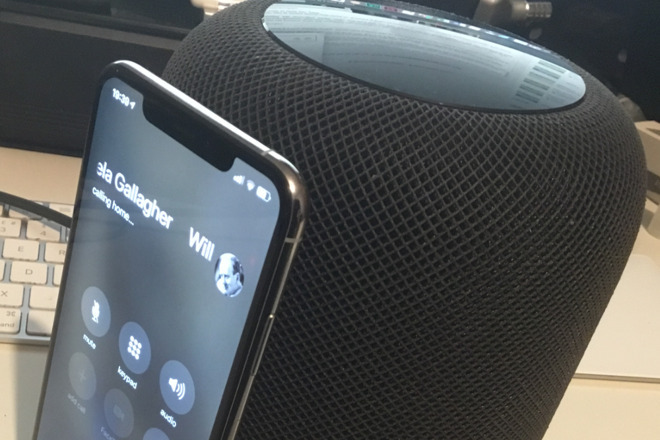 I thought the HomePod would be brilliant for a speaker phone on video calls. So far it is a disaster. Apparently they use a different protocol for iPhone calls. The audio delay for iPhone calls is workable. I think you're barking up the wrong tree. There's no third party app integration with HomePod. 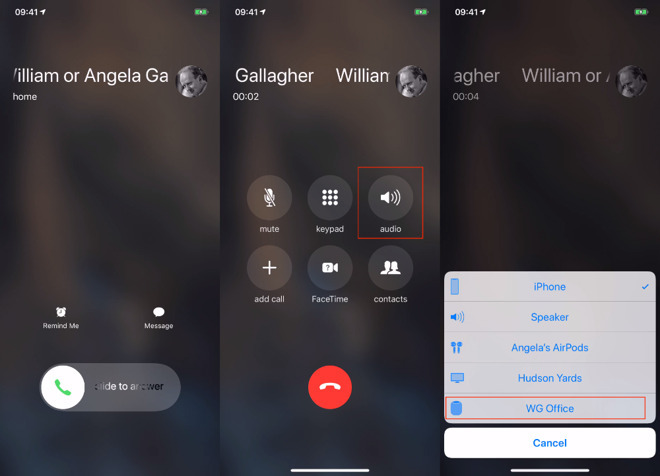 I also haven't seen any indication there's FaceTime integration, though receiving FT Audio calls seems like it'd be possible if not now then in the future. AirPlay is for streaming audio to the HomePod only as far as I know, and by doing that are you even using the microphone in the HomePod? I don't think so. Am I the only person who’d like to able to make and receive phone calls on the HomePod without having to have my iPhone turned on? FaceTime Audio calls maybe possible. However, for your regular calls, you need your SIM, right? How'd you expect to make calls if the phone was turned off? Comparing to Echo and saying it doesn't make "real" phone calls is ridiculous. If you're at home and you're calling a US number on your iPhone while on wifi calling, it's just as "real"as a call on Echo to a US number. You should also be comparing to Google's calling implementation which now works on the Home series, as well as growing numbers of third party speakers (Insignia first, now JBL). Google's calling is also real calling, doesn't need any phone at all, and can be tied to Google Voice. And cleaner integration with contacts vs Alexa. HomePod is better at contact calling in time to convo though, to me. The iPhone integration is a double edged sword for HomePod. Architecturally, a strategic blunder resulting in low sales so I expect that their smart speaker strategy will have some big changes come June. I think on the calling side it's a drawback as Google's implementation is the most flexible and doesn't need a smartphone. On the taking calls side, I think HomePod is a better experience. one thing that benefits everyone, in a perverse way, is the competition absolutely eating apples lunch in the smart speaker market (in the smart home for that matter). It will force them to innovate and deliver far more for less money on the next iteration than they normally would in their typical fashion. You are certainly in a very small minority if you have an iPhone and routinely turn it off for some reason. There are easier ways to silence the phone w/o turning the device off. As others have already posted, William, "good article." You covered all bases, no serious "How do you ..." questions in the comment thread which you haven't already addressed. My phone can be off and I can still make calls via my Google Home speakers. Apple could set things up similarly altho it might take some other involved background stuff to make it work. EDIT: Related to that is another service I think Apple will eventually include. On the way to work this morning it struck me that our pup was suppose to be dropped off at the groomers by my wife when she leaves for work around 7:30 but I had forgotten to remind her. Called and no answer (we no longer have a landline). Called a few minutes later still no answer. So I asked Google to broadcast "call me" on all our Home speakers. My wife called right back. she had been tidying the kitchen and her phone was at her makeup table and probably set on vibrate anyway. And yes she had forgotten. Home speakers have more usefulness than simply answering some questions and turning on a light. Those non-music features will make their way to the HomePod too IMO because they have value to the user, just as this phone call feature has despite some here (you know who you are) ridiculing anything not having to do with music on a HomePod as useless. 100% agree with your analysis. Apart from the consequence - as I don’t see Apple taking the competitive heat. In their typical manner, they will define the speaker market as narrow as necessary to denounce HomePod a success - even when losing money on it. While HomePod can be improved with BT connctivity and better integration, it can’t be tinkered to compete with Echo & alikes. If your carrier supports Wi-Fi Calling on supported iCloud-connected devices then it is possible to make and receive wifi phone calls on non IPhone devices even if your IPhone is turned off. If I can receive calls this way on my HomePod I don't have to keep my phone on while I'm at home, why have two devices that need to be active when I only need one?